Even though Disney's big screen remake of The Lone Ranger bombed at the cinema, it looks like all is not lost when it comes to the Western genre on television, as Hell on Wheels returns for a third season. 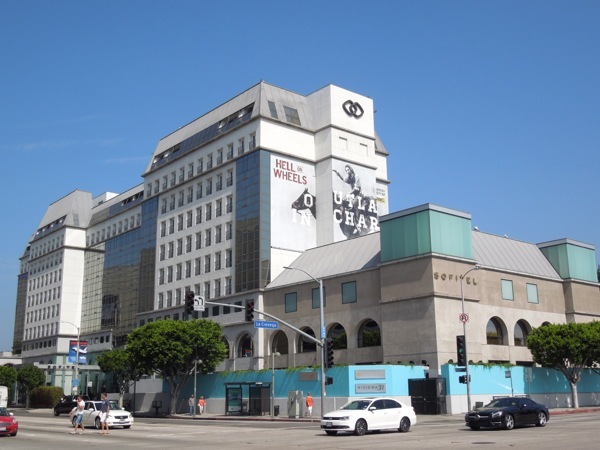 This billboard on the side of L.A.'s Sofitel Hotel along Beverly Boulevard at La Cienega Boulevard may not have the same visibility as the spectacular ad site along San Vicente Boulevard (which has recently sported the likes of Pacific Rim and Man of Steel), but fortunately this advertisement for AMC's contemporary Western series is their most striking creative to date. 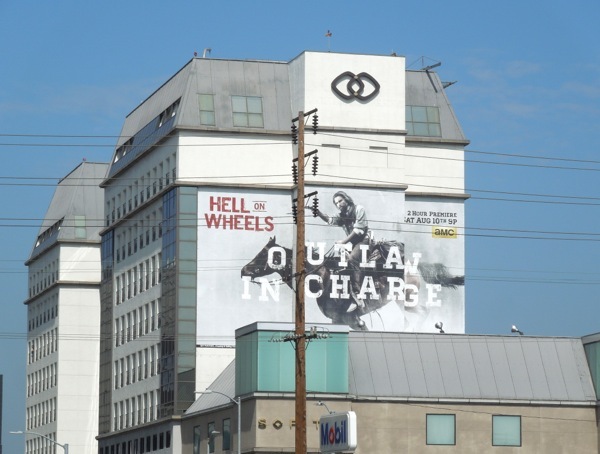 Anson Mount looks very much the cowboy astride his steed, pistol in hand, as former confederate soldier 'Cullen Bohannon' and the 'Outlaw in charge' tagline certainly adds to the Old West feel. For season three it looks like Cullen is leaving vengeance behind to lead the Union Pacific against the Central Pacific Railroad in 1867, so expect the usual mix of racism, greed and murder, but with less revenge and more rebuilding. 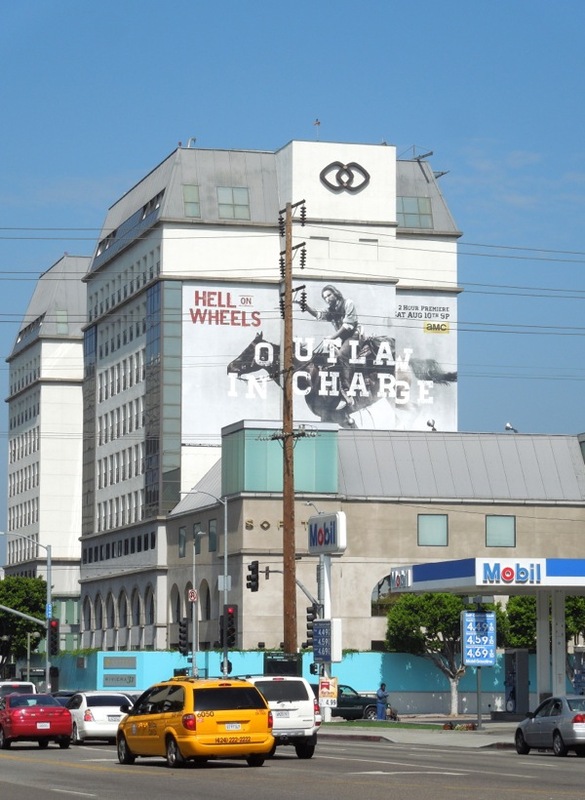 Hell on Wheels returns to raise merry hell on Saturday nights from August 10 in a two-hour season premiere and this arresting giant-sized billboard was snapped on July 13, 2013. 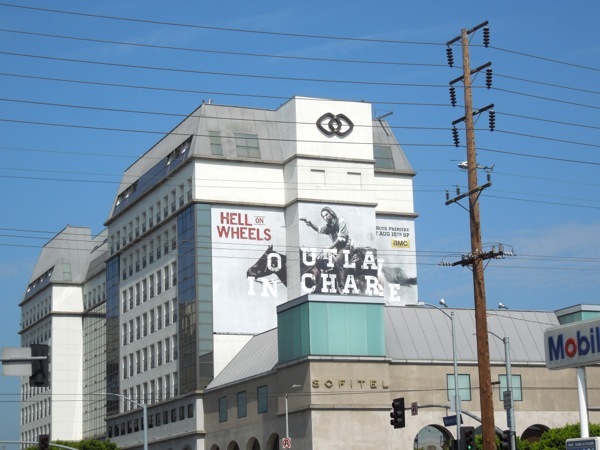 If you're a fan of the show, be sure to also check out these previous season Hell on Wheels billboards.